One of the main concerns for KRIONTM is to invest in training, to encourage relationships based on trust and collaboration with all the links that join the firm together. 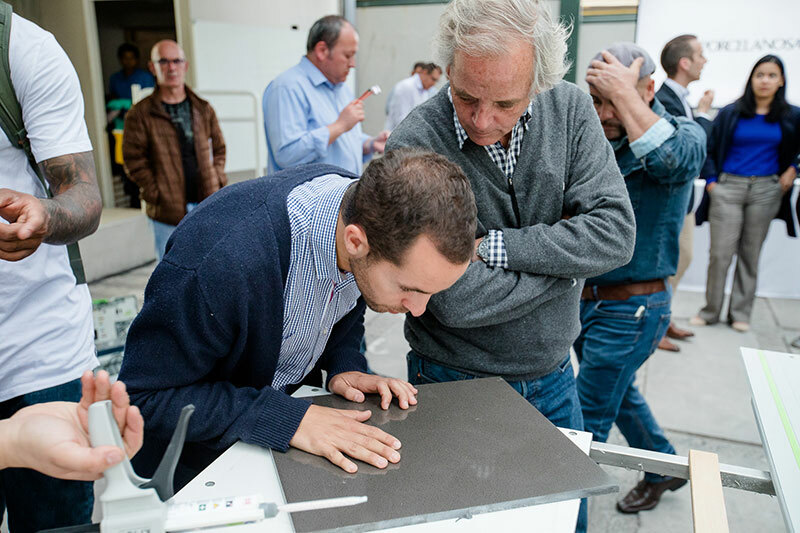 An example of this is the training course for trainers that took place at our PORCELANOSA Grupo showroom in Chile last October 25. There, the future fabricators of the material were able to see the KRIONTM properties at first-hand, and how it should be handled. The theoretical training was given by the commercial technician, Pepe Rivera, who gave those attending an insight into: the properties of the material, its physical characteristics, the composition of the pieces and its multiple application possibilities. The most interesting moment came with the presentation of KRIONTM K-LIFE and its Eco-Active Solid Technology (Keast), which provides the material with new properties that stand out from the rest of the Solid Surface. Our commercial technician explained how four new innovative features had been added to the properties of KRIONTM: air purification, an antibacterial effect without the need to add any additives, the elimination of chemical products and easy cleaning and maintenance. Therefore, KRIONTM K-LIFE got those present thinking, among whom there were companies from the wood sector, along with designers and university professors who, explained how this new material is an extraordinary option for sanitary applications. The second part of the training saw the inclusion of the KRIONTM technician, Jacinto García, who oversaw the practical part of the training. There, stuck techniques were looked at, both in the star colour from KRIONTM , the Snow White EAST by K-LIFE, and in the Taupe Concrete from the Royal series. The different repair techniques for the material, such as: fissures, cracks, pitting and polishing were given the once over. Also, any related doubts raised by those attending were all cleared up. All the advice from the professionals guided the attendees in the projects they were carrying out with KRIONTM. At the end of the training, those who had attended were presented with an attendance diploma. Finally, we would like to take this opportunity to thank the manager, Darío Valverde, and the Commercial Director, Martín Pérez, both from Porcelanosa Chile. As well as that, our thanks go out to all the staff from our Chilean subsidiary for their warm welcome, and their professionalism towards the future brand fabricators.